The Associated Press is supplying feed of Super Tuesday vote results to a Google Map which subscribers to the news agency will be able to embed on their news site and other platforms. In a release, AP said it is working with Google are to make the mapping application available to subscribers of AP Election Services for today’s Super Tuesday results, when 10 states cast their votes to select a Republican candidate to challenge President Barack Obama in November’s election. Our subscribers have always had the option to create these maps on election night, but some of them faced cross-platform challenges. Now, we have a turnkey mapping solution. Its an arrangement that not only makes sense for AP and Google, but also our customers and ultimately the end-user. Google is excited to work with the Associated Press to help visualise and distribute the state-by-state results for Super Tuesday. Our Google results maps will show statewide and county level AP results in real-time at google.com/elections. AP subscribers will also be able to embed the results map on their own websites. We look forward to a successful and exciting Super Tuesday. This entry was posted in Multimedia, Politics and tagged Associated Press, google maps, Super Tuesday on March 6, 2012 by Sarah Marshall. It uses Google Maps and Street View technology and hopes to become the largest user-generated archive of the world’s historical images and stories. 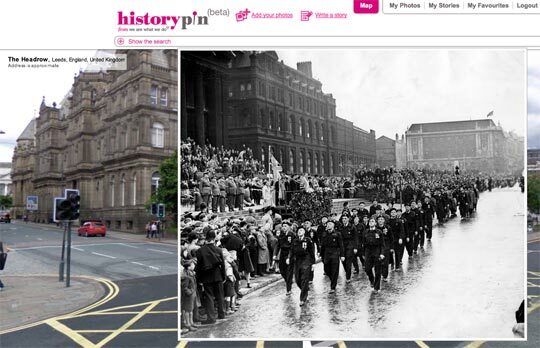 Historypin asks the public to dig out, upload and pin their own old photos, as well as the stories behind them, onto the Historypin map. Uniquely, Historypin lets you layer old images onto modern Street View scenes, giving a series of peaks into the past. It has been developed by We Are What We Do, the “social movement” and campaign that was behind the book ‘Teach your Granny to Text and Other Ways to Change the World’, in partnership with Google. If the technology behind it were opened up, this would be a fascinating way to publishing ‘nostalgia’ pictures from local newspapers, news archives or map historic stories. This entry was posted in Multimedia and tagged google, google maps, Google Street View, Historypin, Mapping, maps, online archive, Street View technology, we are what we do on June 4, 2010 by Laura Oliver. Tony Hirst, the independent developer who launched some of the first projects using the Guardian’s Open Platform, has again used the Data Store in an innovative way – leading to a new story about MPs’ expenses for the Guardian. Hirst’s use of Google Maps shows that there are differences of up to £20,000 in neighbouring MPs’ travel expenses. Hirst clearly couldn’t resist the challenge. This entry was posted in Editors' pick, Multimedia, Online Journalism and tagged Charles Arthur, data store, GBP, google, google maps, guardian, guardian open platform, Guardian technology editor, MPs expenses, open platform, The Guardian, tony hirst, travel expenses on April 3, 2009 by Judith Townend.